The bright yellow flowers of Marsh Marigold herald spring. One the most familiar of our waterside plants and very early to flower it is superb either as a marginal in a pond or as a waterside plant. The Marsh Marigold will also naturalise in bog gardens where the soil is constantly moist. Native, easy and ultra hardy. A good early season pollinator too. Pot size 1.5 litre. Cut back after flowering for a repeat show of flowers in late summer. Seed can be collected and is best sown fresh or simply divide the clumps. 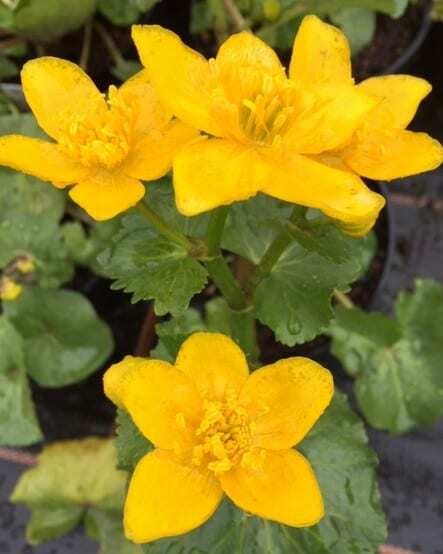 Remove dead foliage in late autumn or early winter as Marsh Marigolds are very early into flower. If using as a marginal planting in water to 15cm/6” deep.